Interested in tracking blood sugar -- what's the quickest way to get there? I am interested in tracking my blood sugar with one of those trackers that sticks to you arm 24/7. What is the fastest way to get one of those gadgets? Can you buy it out of pocket? I may seem naive, but "just ask your doctor to prescribe it" seems overly simple. In your experience, will most doctors even write that prescription for a non-diabetic? There may be an issue if you try to get health insurance to pay for it, but explain to your doctor that you'll pay out-of-pocket (it's only about $80 for a month's supply of sensors). The Freestyle Libre web site gives detailed information to tell your doctor if he seems skeptical. GoodRx lists it for a modest cost saving if you insurance won't cover it. I just got the Libre two weeks ago. It’s not as accurate as the regular meter. The one I have tends to read 10-20 points less and in some cases by 5. I still prick my fingers twice a day. 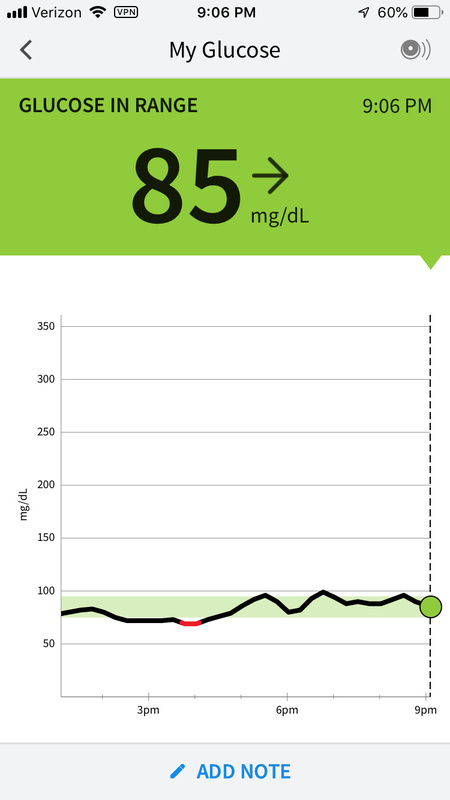 I'm using a Dexcom G5--and yes, @WhyEat brings up a good point--you will also need a regular meter and test trips to calibrate the CGM. And I've also been disappointed that mine is less accurate than I'd hoped. Although for that matter, pricking different fingers can be 10% different on me as well. For the CGM sensor, it matters greatly where I put it (in my so far very small sample size.) My outer thigh did not work at all. (I'd read some people wearing theirs there.) Dexcom 5's are supposed to be on your belly, and that does work the best in terms of accuracy. I did buy mine out of pocket on Amazon after reading about people buying them off eBay. All blood glucose meters have a level of inaccuracy, especially ones that don't require use of calibration solution. 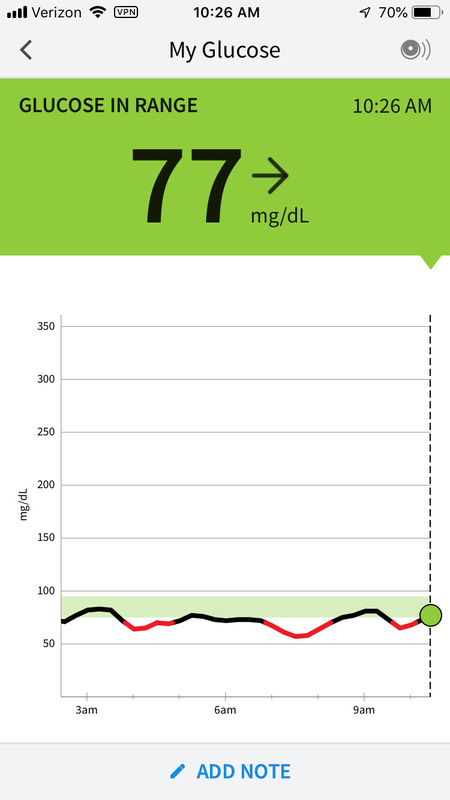 The biggest challenge with the Freestyle Libre sensors is finding a reliable location for placement. Since they are "factory calibrated", they assume some level of body fat on the back of the arm. 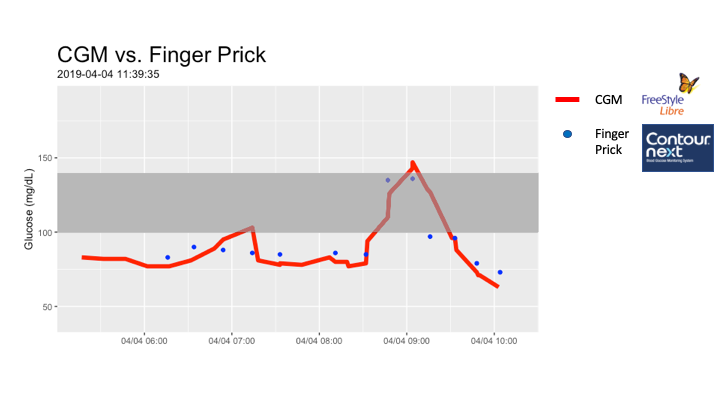 It took me 3 rounds of using the sensors to find my "sweet spot" on the upper back of my arm, where I get the most consistent readings with a fingerstick meter. To say one reading is "right" and another is "wrong" isn't entirely correct, as each sensor has a margin of error. So hypothetically, even if a fingerstick sensor and a Freestyle Libre sensor are accurate within +/- 5mg/dL, when comparing readings their comparisons can be "off" by as much as 10mg/dL. One thing to add is that the trends that the Freestyle Libre provide are accurate, so in the worst case you still can still accurately see peaks and valleys in the data and can simply apply an offset to the values to make them match calibration/fingerstick readings. Worrying about absolute values misses the point. If you really care about trends then Freestyle is actually better, I find, because you can see points you’d miss if you tried to take discreet measurements with a finger prick. 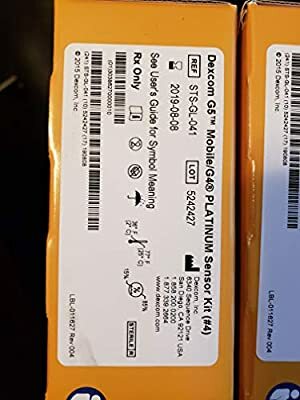 @JessicaK Were you able to buy everything needed online for your G5 without have to go through a doc? and used my iphone as the receiver. I totally get what you are saying about trends. And fantastic graph, @sprague, I should make one of those for the shower data I have. I have become convinced that when my sensor gets very wet (like after a shower), it dips until it gets dry. I did that test, pricking often, but I haven't made a nice graph like you have. I should. 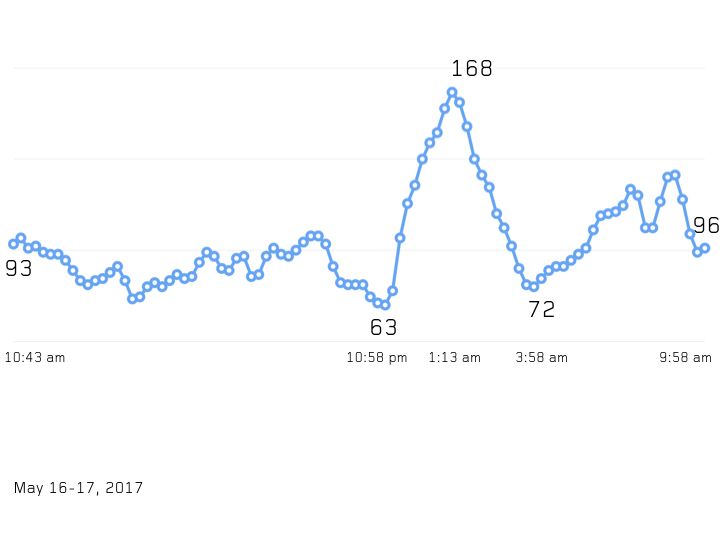 (The spike is real. 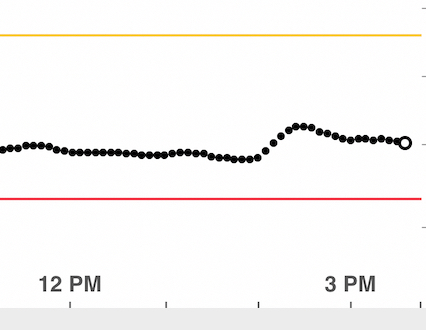 I ate a very carb-y breakfast around 9am) That weird kind of no-reason dip or spike doesn't happen very often. But it still makes me a bit nervous. Then here's lunch today (I ate about 1:45ish). The general trend is that it rises and comes back down, but, by nearly 4pm it hasn't quite come back down to where it started. Is that real? Or is there a bit of drift? I'd have to prick my finger often to test that one, I guess. So that's the kind of thing I'd like to know, and I'm not sure it's accurate enough to tell. Just in general, if I want to compare apples to chocolate, I do need to know that the amount it rises one day is equivalent to the amount it rises the next day. And I would like to compare that. I guess I'd have to run several trials pricking my finger often to be confident of that. But, overall yes, I'm very happy with the information I'm getting. This is a very interesting discussion. 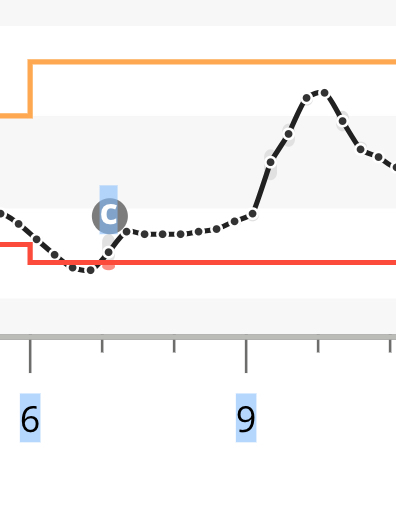 When I was using the Freestyle Libre I saw four unexplained spikes in the middle of the night. Various theories about what caused this. A leading theory is measurement error, perhaps something affects the sensor if I roll over on it? A suggested approach would be to wear one on either arm, but I don't have new ones to test. They were hard to acquire at the time but I gather it's now much easier. Here's a graph of one of the spikes. Wait, a spike event that lasted five hours from start to finish in the middle of the night? Do people remain in basically one position (e.g., laying on their side) for that long? As I understand it, there would be numerous small movements during that amount of time asleep, but I kind of thought there would be at least a few whole-body movements as well. Please correct me if I'm wrong, of course.